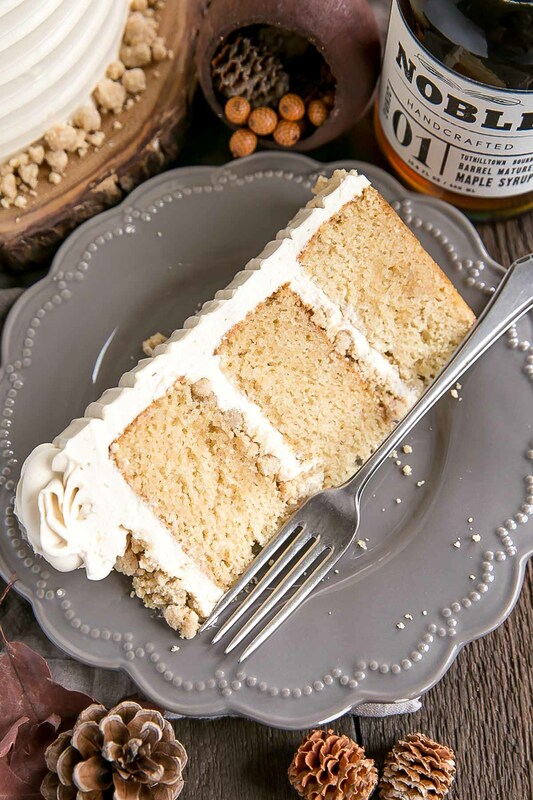 This Maple Cake is packed with pure, natural maple flavour throughout. 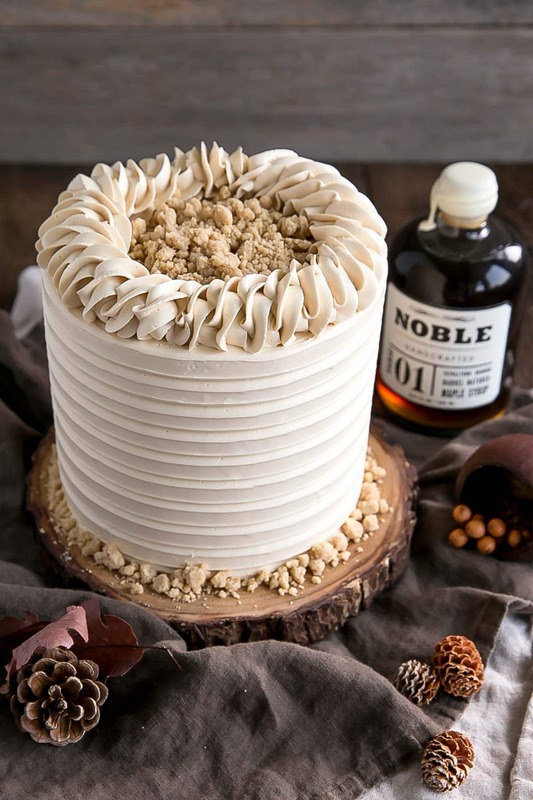 Maple cake layers with a maple buttercream and maple streusel. It is cold and rainy today, and I’m in heaven. We’ve gone from 35°C temps just a couple days ago down to 15°C. It’s a drastic change, but I am not complaining. It’s been a ridiculously hot summer. 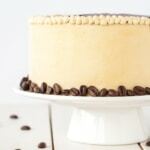 So, I am welcoming Fall with open arms and kicking it off a little early with this Maple Cake! Truthfully, it’s all I could do to restrain myself from inundating you with Fall recipes even earlier. I feel like late August is an acceptable time to start thinking about all things Fall — if you’re like me, you’ve probably been dreaming about those cool, crisp Fall days for weeks now. 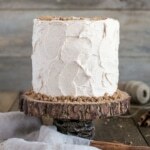 This Maple Cake I bring you today is packed with all natural maple flavour throughout. 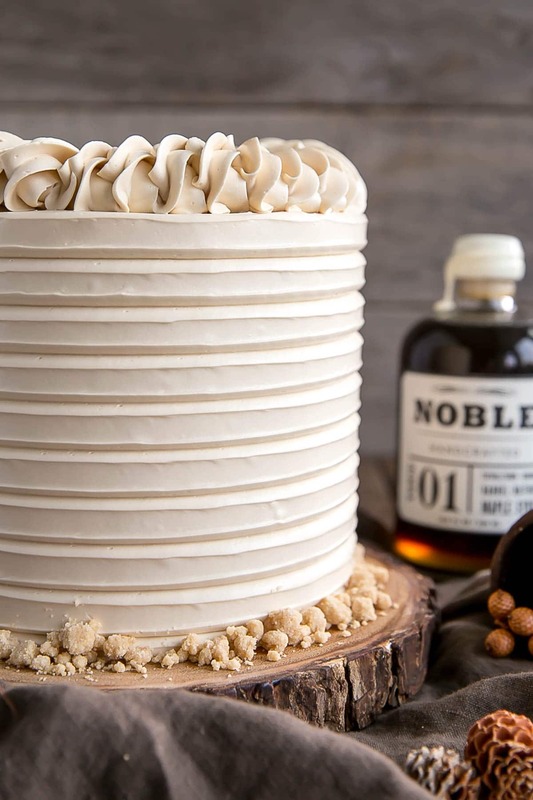 In general, I prefer to not use extracts and emulsions for flavouring if I can help it, so I’ve used pure maple syrup and maple sugar in the cake and frosting, as well as an amazing maple liqueur (Cabot Trail) that I didn’t even know existed until a couple months ago (thanks Toni!). 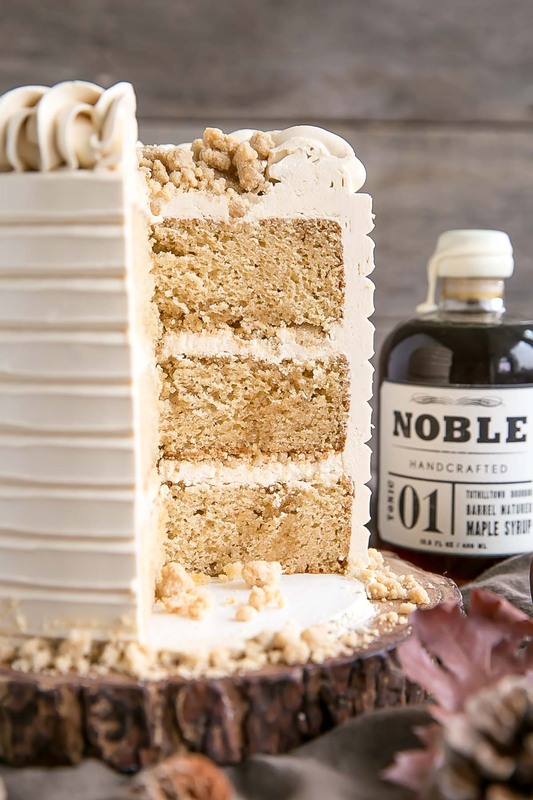 The maple liqueur is optional, but it gives the cake and frosting a nice kick. For the maple cake layers, I modified my Vanilla Cake recipe, swapping out the granulated sugar and milk for some brown sugar, maple syrup, and maple liqueur. 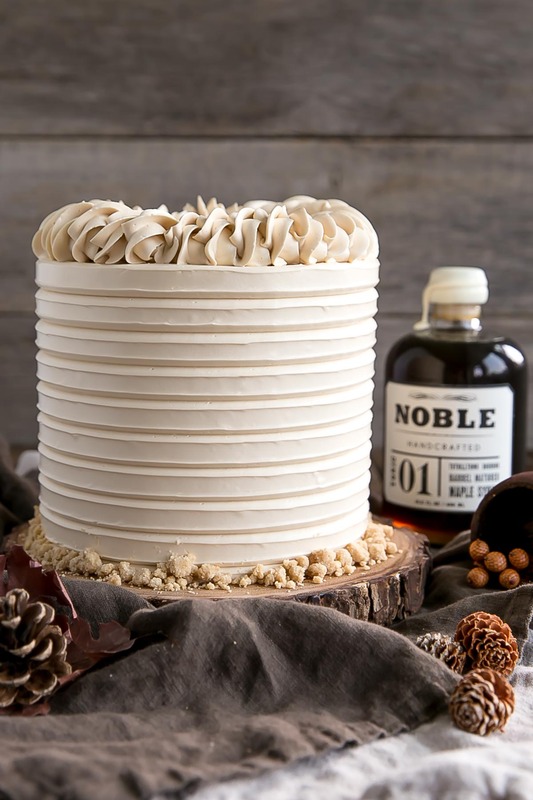 The cake layers have a delicious maple flavour on their own and would pair equally well with a plain Vanilla Buttercream, but I wanted to go maple all the way. 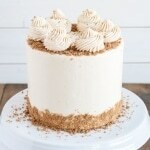 The Maple Swiss meringue buttercream gave me some trouble though, in my experimenting. I initially tried to make it with straight up maple syrup. Basically egg whites and maple syrup. In my mind this should have worked. I know it works for an Italian meringue, so it should have worked for a Swiss meringue, right? Well, it didn’t. Or at least the one time I tried, it didn’t. It’s entirely possible that the error was on my end, and that I overheated the egg whites before whipping. They heated up much faster than they would with granulated sugar, and I should have kept a better eye on them. When I went to whip the meringue, it ballooned like crazy and filled my entire bowl almost instantly. It was thick, dull, and almost chunky, the way straight up whipped egg whites would be if you overbeat them. Or something. So maybe the mistake was in the heating, but I didn’t want to waste another 6 eggs + 1 cup maple syrup to try again. Instead, I opted for maple sugar. I had to order this online, which was a bit of a pain, but I’m sure you could find it in a local health(ier) food store. The maple sugar worked much better, but my meringue still didn’t get that typical glossy shine. I went with it anyhow, as it was stiff and otherwise okay, and added the butter. After some whipping the buttercream came together perfectly. If you’re having a hard time finding maple sugar, or just don’t want to bother with it, you can give the maple syrup a try and let me know how it works out. 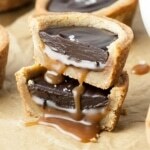 Or you can just use light brown sugar instead, with maple syrup (or extract) for flavour. 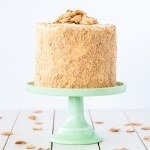 The maple streusel was a total afterthought but one of my favourite parts of this Maple Cake. I had forgotten how much I love having a crunch layer in my cakes and how easy it is to do. Literally some flour, sugar, and butter stirred together and baked for 5mins. That’s it! The maple streusel recipe below makes way more than you’ll need (probably twice as much), so feel free to cut it in half. I like to make a lot because I like to pick out the larger chunks of the streusel for the cake rather than the small crumbs, and there will always be small crumbs. You can always use the extra as a yogurt topping or something similar! The design on the sides of the cake was really easy to do. I just did a thicker coat of frosting on the outside and smoothed it with my icing scraper, then ran an icing comb (the far left one pictured here) around the sides of the cake for the effect. The rope border on top is the same one I’ve done before, and I love it. It’s also very simple, with just a 1M piping tip. The maple flavour in this Maple Cake is amazing. Ryan says it reminds him of eating pancakes, and I honestly can’t think of a better compliment. If you’re a maple fan or looking for that perfect recipe to ease into the Fall season, you will love this one!! 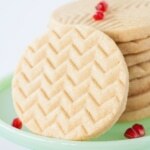 Try to use good quality pure maple syrup for this recipe. I use a Grade A dark amber. Do not use pancake syrup. The maple liqueur is optional. You can sub in more maple syrup instead. Or you could pair it with something like bourbon! The eggs will take longer than normal to incorporate due to the small amount of granulated sugar, so be sure to whip well with each addition. Add a bit of the flour mixture after the last egg if needed to help it come together. The meringue may not be as shiny as a typical meringue due to the use of maple sugar vs granulated sugar. If you don’t want to bother with maple sugar, you can use light brown sugar instead and maple syrup (or extract) for flavour. This recipe makes much more maple streusel than you’ll need, but I like to have the option to pick out the larger chunks. Feel free to halve the recipe if you prefer or use the extra as a yogurt topping! If you like, you can add some chopped walnuts or pecans to the cake batter for even more flavour and crunch! Preheat oven to 350F. Grease and flour three 6" (or two 8") cake rounds and line with parchment. In a measuring cup, combine maple syrup and maple liqueur (or milk). Using a stand mixer fitted with a paddle attachment, beat butter and sugar on med-high until pale and fluffy (approx 3mins). Reduce speed and add eggs one at a time fully incorporating after each addition. * Add vanilla. Alternate adding flour mixture and maple mixture, beginning and ending with flour (3 additions of flour and 2 of maple). Fully incorporating after each addition. Place bowl on your stand mixer and whisk on med-high until the meringue is stiff and cooled (the bowl is no longer warm to the touch (approx. 5-10mins)). The meringue may not have the shine of a typical meringue. Add maple liqueur (or maple syrup) and whip until smooth. Place one layer of cake on a cake stand or serving plate. Drizzle with 2 tsps maple syrup if desired. Top with approximately 2/3 cup of buttercream. Spread evenly. Top with approx 1/3 cup of maple streusel. Press gently into buttercream. Repeat with next layer and place the final layer on top of the cake. Crumb coat the cake and chill in fridge for 20mins. Generously frost and smooth the outside of the cake. Using an icing comb to do the design on the sides and a 1M tip to do a rope border on top. Fill the middle with extra streusel if desired. * The eggs will take longer than normal to incorporate, be sure to whip well with each addition. Add a bit of the flour mixture after the last egg if needed to help it come together. ** This recipe makes much more than you'll need, but I like to have the option to pick out the larger chunks. Feel free to halve the recipe if you prefer. *** Wipe your mixer bowl and whisk down with lemon juice or vinegar to make sure it is completely grease free and make sure there is no trace of yolk in your whites or your meringue will not stiffen. 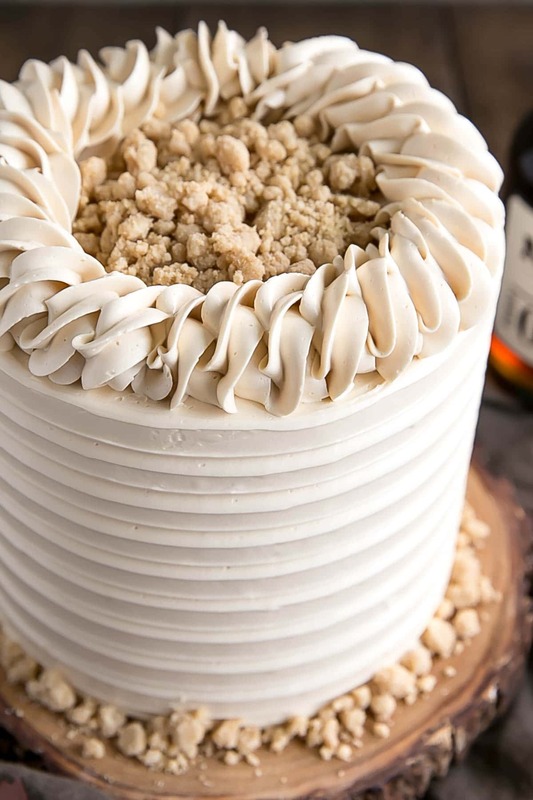 **** The buttercream may look like it's curdled at some point. Keep mixing until it is completely smooth. If it looks soupy, place it in the fridge for 20mins and rewhip. 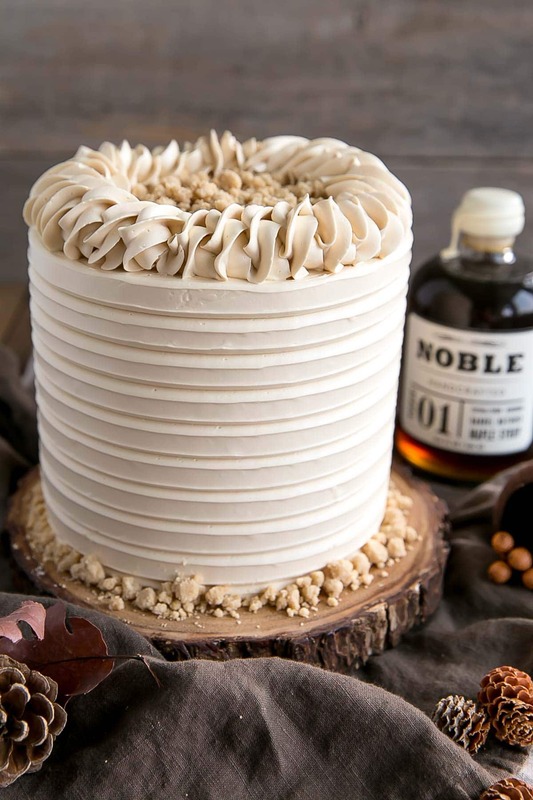 If I use brown sugar, maple syrup and regular bourbon, do you think the maple flavor will still come through in the actual cake? Hi Rebecca! Do you mean for the cake itself? I found the flavour to be perfect with all of the components together so it should still come through. 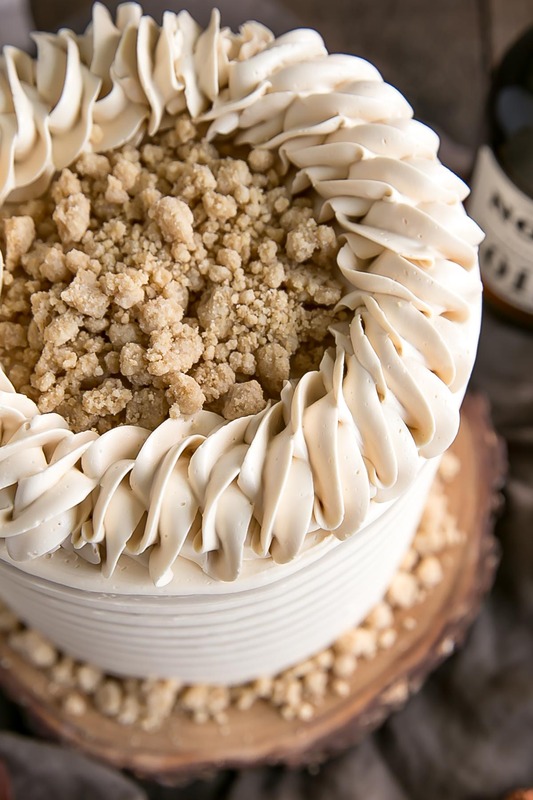 I made the Maple Cake and the Maple Streusel portions of this recipe. – Baked a single recipe’s worth in an 8-inch round tin and then torted it into 2 layers. – Used King Arthur Flour Maple Sugar. – Used homemade Maple Liqueur using a recipe from AllRecipes. – Took 53 minutes to bake. The cake was delicious! I would say the maple flavor was mild. Great crumb to the cake – moist yet sturdy. – Made a single recipe and used 2/3 cup to fill 3 layers of my 8-inch cake. – Had approximately 2 cups leftover. – Baked for 15 minutes. – Added 1 cup of Toffee Chips after it cooled. The Maple Streusel was delicious and so easy to make! The crunch is a nice addition to the cake! I really liked the addition of the Toffee Chips. Hi Jennifer! Thanks so much for all your tips. So glad you liked these and I love your addition of toffee chips to the streusel! I really want to make this for Thanksgiving, but I’ve got a boatload of other cooking to do the day of. Do you see any problems with baking the cake layers the weekend before and freezing them for a few days? Will the cake dry out? Any other make-ahead tips? Hi Kim! Freezing the cake layers will work great, I do that all the time. You can also make the frosting in advance and store in the fridge — bring to room temp and rewhip before using. Streusel can be made in advance and stored in an airtight container. Let me know how it turns out! Just made this but I made the middle layer a spice cake. So delicious. So glad you liked it Brenda! This looks wonderful! I’m hoping to bake this for a family dinner on the weekend. Can it be baked in a bundt pan? Hi Stacey! It should bake fine in a Bundt pan. I hope you like it! I just made the cake and it is sooo good. The second one from your site. The first one was the pecan pie cake. And yes, this one is like pancakes, but better. Perfect for a brunch desert. I used bourbon for the cake and brushed the cake with syrup before icing. Thank you for your time in this site. The site is very informative. This cake looks amazing! 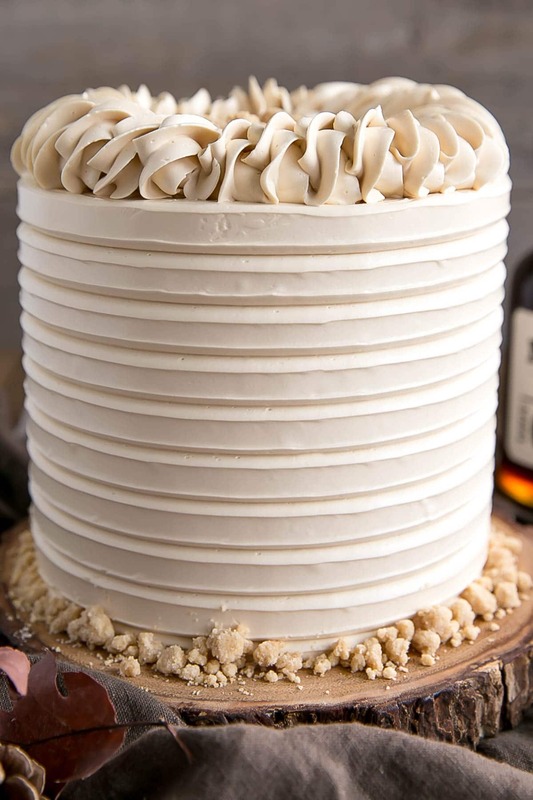 Would the icing be sturdy enough to use under fondant in a stacked cake? Hi Kyla! Yes I think it should work fine. Just chill it till firm before adding fondant. Hi Liv I noticed when you linked the Maple sugar you linked 2 different kinds. The one in your writing is different than the one in the ingredients. Which one did you use? Thanks! 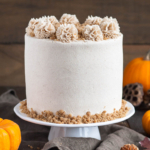 What a beautiful and perfect-for-fall cake! I must say, the best maple syrup comes from Canada, right? The rope border on top is absolutely stunning. Is it difficult? Thanks so much Cindy! The rope border is actually dead simple. I have a tutorial in my IG highlights :). What brand of maple liqueur did you use? Did you use maple liquor or maple cream? Hi Karen! It’s actually a maple cream liqueur! 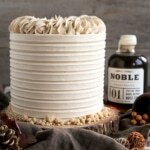 How do you make the rope edge on this cake. I bought the set of icing combs a few months ago but had no luck with them. Now that I see you cake, I think I can see how they’re supposed to be used. Thanks! This cake is gorgeous!